The former FC Barcelona player, who frequently posts on social media, has not done so since Friday. PARIS SAINT-GERMAIN star Neymar is urgently travelling to Brazil due to “personal matters”, the Brazilian company that manages the footballer’s career said on Sunday. Neymar is “coming to Brazil for personal matters”, a source from NN Consultaria told AFP, without specifying whether the player had already arrived in South America or the specific reasons for the trip. French radio station RMC Sport reported that Neymar flew to his native country on Saturday night after receiving “bad news involving his family”. 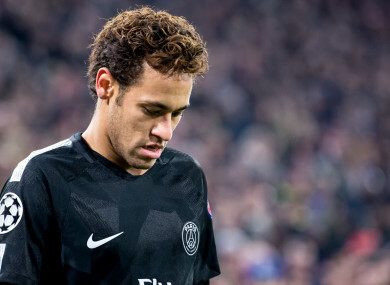 Neymar was suspended for the 3-1 victory over Lille on Saturday, but he looks likely to miss Wednesday’s match against Strasbourg before returning next Saturday against Rennes. Email “Neymar headed to Brazil for 'personal matters'”. Feedback on “Neymar headed to Brazil for 'personal matters'”.